When Darryl Coaston walked out of the county jail in October 2011, it was the start of a very different life. No more selling drugs or “doing whatever it takes.” He was starting a training program and work, and he had an ally in a community caseworker who would stand by him in the months ahead, all as part of an Allegheny County Jail Collaborative program. He did say yes, though, because he thought it would be a better way to kill some time. He would spend more than a year in the Jail Collaborative’s Reentry Program. The program begins in the jail and continues after release, working specifically with people at higher risk of recidivism and who are serving a county sentence. It starts with giving each person an assessment of their strengths and needs, which case managers and participants use to shape a service plan. The program then provides human services and treatment, including service coordination in the jail, which continues for several months after release. While each service plan is unique, every person in the program receives cognitive behavioral therapy (CBT). For Coaston, CBT opened his eyes and helped him change his ways of thinking. “It was the best thing I could have ever done in my life at that point. We acted out scenarios of our own life situations to help us change our pattern of thinking. Seemed silly at the time but it really worked. I actually still use some of the methods we were taught.” A class in family support he also attended while in jail challenged him to think about what being a great father really means. He learned more about what children need from their parents, he was able to talk with his children every week, and the family support staff helped arrange special family visits. When Coaston was getting close to the time of his release, his case manager met with him and enrolled him in the culinary arts training program he had selected. This case manager proved to be the “greatest, biggest fan and supporter, always fighting for me and wanting nothing but the best for me.” She helped him get the transportation, clothing, and groceries he needed, and linked him with a housing program where he could live while in training. While the training program was demanding, it also included the chance to work in his new profession during the evenings, so Coaston stuck with it. Coaston is one of hundreds of people who put in the effort to change the course of their lives. The Jail Collaborative was there to support them with concrete assistance that makes a difference. Back in 2000, Marc Cherna, the director of Allegheny County’s Department of Human Services, the warden of the jail, and the director of the Department of Health met for dinner to talk about what they could do for men and women who kept returning to the county jail. “We all had the same concern about the same people. There were people going in and out of the jail because of mental health or drug and alcohol issues or because they needed job skills and employment. Too many were discharged without a plan for getting the basic help they needed,” said Cherna. The recidivism rate exceeded 60 percent. From that informal start, the Jail Collaborative has grown to involve more than 150 government agencies, nonprofit organizations, and community members, all focused on one aim: to reduce recidivism. By taking on large systems challenges and building programs, they have accomplished that goal. It was this collaborative that put in place a better process for discharge and release from the jail, including a discharge center that now coordinates releases; expanded substance use treatment and co-occurring treatment in the jail and post-release; expanded housing and career training programs; built additional diversion programs; expanded crisis intervention training to more officers; developed community resource centers for probationers; and designed and built the Reentry Program. Two 2014 studies confirm that the Jail Collaborative is reducing recidivism: The Urban Institute found that the Reentry Program reduces re-arrests by a statistically significant amount (24 points compared with a matched group) and prolongs the time to arrest; and a cost-benefit analysis by Allegheny County, with support from the Vera Institute, found that the community resource centers operated by the Court of Common Pleas (Adult Probation and Parole) had lower rates of re-arrest, compared with people of similar risk levels who had received typical probation instead . It is not unique for leaders to tackle the problem of recidivism at a county jail since the human and financial toll of re-incarceration concerns every part of this country. What may be unusual in the case of the Allegheny County Jail Collaborative is how its leaders make decisions at the intersection of criminal justice, human services, and health; and that the Jail Collaborative is not an established nonprofit or unit of government but a partnership that agrees to implement reforms and programs. The structure of the Jail Collaborative is simple. Its leaders form a Cabinet that includes the President Judge and Administrative Judge for the Criminal Division, Fifth Judicial District of the Court of Common Pleas, the Warden of the Allegheny County Jail (a facility that houses 2,500 men and women), the Directors of Allegheny County Department of Human Services and the Allegheny County Health Department, and the Chief of Staff for the Allegheny County Executive. It has two committees: the Civic Advisory Committee, which is chaired by the president of a local foundation and includes other civic leaders, criminologists, and business people; and an Operations Committee, composed of the deputies of each of the organizations on the Cabinet, which is responsible for program planning and implementation. The general membership of the Jail Collaborative includes more than 150 individuals and providers who are working to reduce recidivism. One of those accomplishments is a career training program for people in the jail and after release, which the Jail Collaborative made part of the Reentry Program through one of several federal grants. One of the options, and the one Darryl Coaston chose, is culinary arts. This is how he came to Community Kitchen Pittsburgh as a chef trainee. 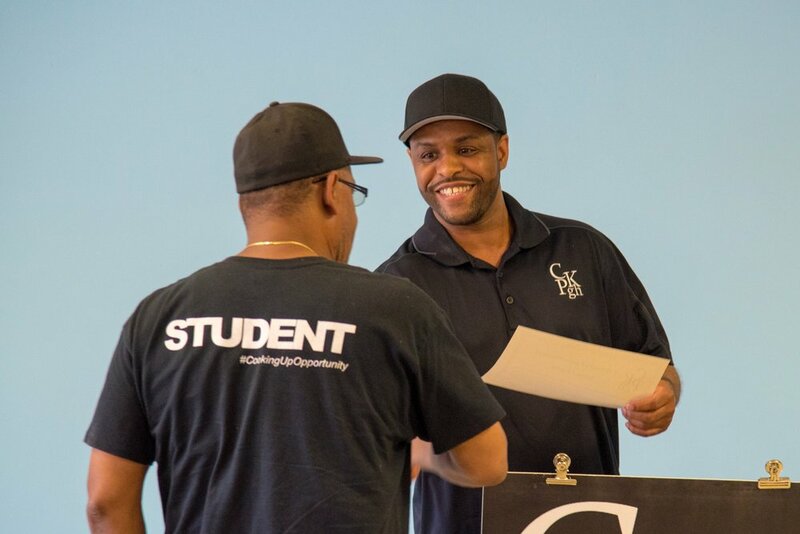 Coaston completed his training and because of his culinary and leadership skills, Community Kitchen Pittsburgh hired him to be a trainer. Today he is the nonprofit’s Lead Chef Trainer, responsible for teaching people who have been incarcerated and others who want to be chefs.